I really didn't have any support early on in my career and because of that, I promised myself that when I achieved some level of success I'd never refuse anyone who asked for help. The question I get asked the most is: what advice would you give to an artist just starting out? Here are 5 mandatory tips for emerging artists. Make it easy to remember, preferably your full name .com. If your name is common like a "John Smith" and the address was taken, then add "art" or "paintings" or something similar to that to the end of it. Make it EASY. You will have to use this address to attract people to your work every day of your life. Do not use some free service that doesn't allow you to have your own name. If you make ANY investment in your career monetarily, this is the one to make. Social media is not the sole answer to a thriving art career. You need a good website with a portfolio and content to establish a presence online and to have your site found on Google. Whenever I say this I usually get these responses - "I haven't sold anything yet" or "I don't feel like I've had enough instruction." The problem with this mentality is that if you wait until you're established, you've missed out on years of opportunities. You should be working on building an identity and a brand. Worry about clients. I've seen many young artists thrive on the attention they receive from professors and fellow students while forgetting to learn the business aspect of this profession. They fail miserably in the real world because they spend far too much time being a temporary rock star and not enough time thinking ahead. If I could go back in time, I would've been more proactive in building my audience and focused more energy on finding my niche. I could have saved myself over a decade of work later on. If you're not in college, please seek out a professional and capable artist to study with. Make sure that individual has a strong presence, an understanding of the business and a willingness to not only further your talent but help you succeed in your career. This discretion will be paramount to your success. 3. Paint and draw every day. An art career is about mastery. In order to master any skill, you have to have at least 10,000 hours of hard work invested. In simple terms, if you practice each day for 2 hours you will master your skill in just over 13.5 years. What are you waiting for? Stop the excuses and start putting in the work. Find time. For years I had to work at a job to support my household. I would paint from 9 PM - 2 AM each night and get up for work at 6 AM. If you continue to make excuses someone willing to put in the time will succeed while you're goofing around. There is no other way. Start putting in the sweat equity necessary to make you a better artist than you are today. START NOW. You have to be a people person. If you are really talented but scared to death of meeting people and selling yourself, you will fail. In my 23 years, I've never seen a millionaire just wandering the streets looking for talented artists. You have to do the legwork. If you're horrible at schmoozing, selling your art and increasing your self-worth, then I strongly advise you to work with a gallery. However, they will take 50% of your hard work but if that's something you can live with, by all means, go for it. If you decide to do it on your own you will need to spend 50% of your day marketing to your potential clients. And most importantly, learn to connect with people, and by that I mean, really listen to your prospective client and employ empathy. If you're good at finding and creating connections then you will find a lifetime of happiness in this profession. If you want to be an "art" elitist who believes that creating art is more important than selling art, be prepared to eat ramen noodles while depending on family for money for the rest of your career. I applaud your idealism but that doesn't make you independent or interesting. MAKE CHANGES NOW. Do what you love and do it better than anyone else. There is certainly nothing wrong with modeling your work after someone else but at some point, you need to find what resonates with you personally. This takes time. You need to find your purpose and vision - it's so important to your success. Trust me, I felt so confused as a kid not knowing what I wanted to paint but in reality, I hadn't lived enough to formulate a strong voice or purpose. So, I encourage you to attack life with all your energy from the very beginning and understand that life's hardships and lessons will play a major part in your artistic journey. I liken it to a river - you need to lay back and let the river take you where you need to go. Don't fight the current. If you're worried about failing, learn to accept that you will. The greatest people we know in history from Napoleon to Abraham Lincoln to Thomas Edison to Henry Ford all failed miserably in their careers. It's what they did when they failed that counted. Get back up and dust yourself off and accept that all failure is a strong lesson. You only completely fail when you quit. Will family, friends, professors, fellow artists, and critics be there for you when you need their support? Unfortunately, not always and maybe in some instances, never. Remember that you are responsible for your dream and you should only share that vision with people who will listen without offering soul-crushing scrutiny - anyone who makes you feel like your dream is not worth pursuing is not worth opening up to. Surround yourself with supporters who are willing to either lend a financial hand or a loving ear - I can't stress this enough. But what if I don't have money for materials or marketing? Do what you can. If all you have is a phone or computer to promote yourself on social media, then do it. If you have to paint on cardboard you get from your local supermarket then do it. If you need to paint with children's paints then do that. The key is to never make excuses. If you allow yourself the opportunity to be a working artist everything will figure itself out. 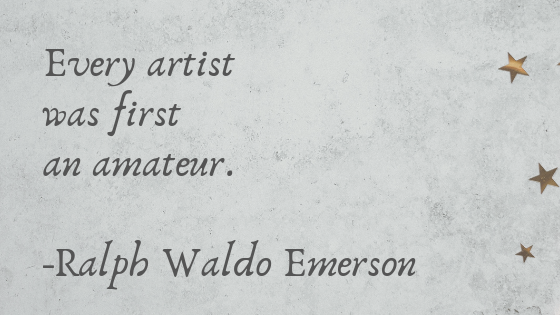 Most importantly, remember what Ralph Waldo Emerson said, "Every artist was first an amateur." I've been in your position - I've been afraid, self-critical to a fault, nervous and uncertain at one time or another. But I hope to inspire a new generation of successful artists who'll bravely change the perception of our profession and forever destroy the starving artist cliche. I needed to take pain pills to continue my art work. When I paint then I forget about everything. Unfortunately I can't participate in the art fairs now because of my back. However, I participated in two large exhibitions entitled "Superfine DC" and "Spectrum Miami" last year. After that my portfolio was added to the Red Wood Media Group. I opened my website, an art store, and set up a Google search. Marisa, all your suggestions are effective. In the first five minutes after opening my art store, one art collector bought two paintings. I was waiting on feedback from a buyer, because the buyer usually states the truth. After receiving feedback, I started to believe in myself. It was some amazing feedback. Dear artists, read about what Marisa Morgan stated because she is giving real advice based upon her professional experience. P.S. : Always try to help other artists. Copyright (C) 2019 FestivalNet.com All rights reserved.